New SwivlPad Turntable Completes LapWorks "Laptop Desk Ensemble"
"This page shows how to get at and possibly replace your iBook hard drive. Note that this will void your warranty and probably cause you considerable stress. Proceed at your own risk. "The iBook developers note says that it will take up to a 12.7 mm tall hard drive. This is not true. The drive in the iBook is a Toshiba MK3211MAT (8.5 mm tall?) hard drive. It should also fit a 9.5 mm drive. I tried putting in a 12.5 mm drive and while I was able to close up the machine, the top of the bottom half and keyboard bulged way too much to leave it in. So, if have a thin enough drive bigger than the original 3.2 GB drive read on." For a report by someone who used the tutorial successfully, visit 2 Guys, a Mac, and a Website. "You should use a 2.5 in hard drive with a max height of 9.5 mm. Although one reader in the past put a 12.5 mm hard drive in a PB G4 12 in model, the taller drive blocks airflow inside the case. 9.5 mm high hard drives are currently available in sizes up to 80 GB. Hitachi 80 GB 9.5 mm notebook drive reviewed here recently.)" BlueChip "Pismo" upgrade service for PowerBook G3 2000, a.k.a. PowerBook G3 FireWire, a.k.a. "Pismo"
It is no longer necessary to send in your entire computer; PowerLogix only requires the Pismo CPU card itself. For more information, visit PowerLogix. 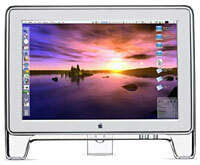 ATI Technologies Inc. has announced the availability of its Remote Wonder for Mac. Available through ATI's website for $49, the radio-frequency (RF) remote control works with any Apple computer equipped with a USB connector to access a host of multimedia application functions available to Apple consumers. Similar to the PC version, the wireless Remote Wonder for Mac works through walls, enabling users to maintain computer access while roaming through their house, stage, boardroom, or classroom, eliminating the need to point the remote directly at the receiver. With full built-in mouse control and programmable macro buttons, the versatile Remote Wonder creates a home entertainment environment by providing wireless access to Apple's core multimedia software technologies, including: DVD playback, movie file playback (QuickTime), music playback (iTunes), live presentation control (PowerPoint, Keynote), and Internet surf control (Internet Explorer, Safari). MacMice has announced the release of its iPerch clear acrylic desk stand for Apple PowerBooks and iBooks. 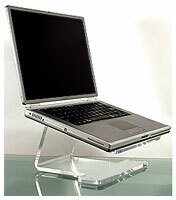 The iPerch is built to provide an alternative to the other premium clear acrylic Apple notebook stand on the market by answering the most common request of customers who want a pretty stand - but one that is sturdy enough to type directly on the PowerBook or iBook without using a separate keyboard and mouse. iPerch is hand crafted from 3/8" thick acrylic and has been carefully engineered to provide a rock-solid perch for even the massive 17" PowerBook. iPerch is made from Acrylite brand clear acrylic, the most optically pure such material sold. Acrylic is inherently a fairly elastic material. However, by paying careful attention to the structural design of the iPerch and its appearance, MacMice have built a stand that can be used for direct typing. They simply made the body of the iPerch thick enough (a full 3/8" thick) and wide enough (6 full inches through the middle) to be sturdy. The iPerch is hand fabricated, one at a time, in Tennessee, using U.S. made Acrylite brand acrylic. The bends are hand formed using a slow heat bending system that puts less internal stresses inside the product than mass production heating systems create. This means the iPerch is much less likely to crack or shatter. All of the edges are flame polished to a gleaming mirror shine. The iPerch is a true craftsman's product. The iPerch is engineered and crafted to provide a lifetime of service, and to hold your Apple notebook at just the right height and angle for effective, comfortable use, with or without a separate keyboard. The PowerBook or iBook (any size, including the 17" PowerBook) is held snugly in place by soft, gummy clear plastic pads on the top surface of the iPerch. MacMice tested both a front lip version and this version and determined that there was simply no risk of a notebook sliding off of the iPerch using these amazing little pads. The iPerch is available for US$39.99 at the MacMice website. LapWorks Inc. has announced the SwivlPad accessory to its flagship product, the Laptop Desk v2.0. Placed beneath the Laptop Desk when it is configured to work at a table or desk, this small disk is a turntable that allows for 360° rotation and viewing of notebook screens. 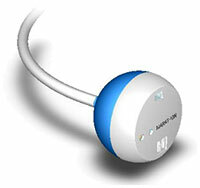 Ava ilable only from LapWorks' website, the SwivlPad is $19.95, or $15. when purchased with a new Laptop Desk. The SwivlPad features non-slip material on both outside surfaces to securely grip all surfaces. Very thin (3/16") and lightweight (6 ounces), the 8-3/4" diameter SwivlPad easily fits between the folded panels of the Laptop Desk and into any computer bag. "The SwivlPad is perfect for those situations when show-n-tell is essential and a picture conveys a thousand words," said Jose Calero, LapWorks' president. The dry lubricating Teflon® inner layer allows effortless swiveling for 360 degree screen-sharing, but provides just enough resistance so the notebook does not rotate freely when the user is typing. The SwivlPad completes the "Laptop Desk Ensemble" to further support mobile computing. The two other components are the flagship Laptop Desk and its snap-on MouzPad, which creates a 6" by 9" mousing surface for notebook users who prefer using an external mouse. The individual components of the ensemble sell separately for $59.85, or $49.95 when purchased together. The Laptop Desk is a portable notebook platform constructed from heat-conducting polycarbonate plastic which resists heat buildup, and has built-in ventilation channels which allow hot air to escape, cooling a laptop by 15% to 20%. Available for $29.95, the Laptop Desk v2.0 serves as a lap desk and also doubles as a desktop stand. When folded over, it elevates the screen and inclines the keyboard to one of five ergonomic typing angles. 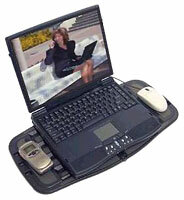 The Laptop Desk spans the entire lap, creates ample workspace for portables, and prevents "hot leg." Lightweight (1 lb., 6 oz.) and thin, it fits right next to the notebook in any computer bag when folded. Nonskid rubber on every surface prevents portables from slipping. The Laptop Desk also supports Tablet PCs, PDAs with external keyboards, and projectors. LapWorks also offers other accessories which support mobile computing, such as a non-sagging keyboard light, an optical USB mini scroll mouse, and a 4 port USB hub. The IceBookBags are a great offering as far as carrying bags are concerned. However, customer demand inspired a solution à la TiCase that would be more robust in keeping with the iBook and yet preserve the elegant form factor. A jet black ABS case complements the durable iBook in a very nice way while taking the worries out of rough transit and offering a tidy way to store things. The interior is specially cutout heat-resistant foam made to measure - it fits the iBook like a custom-tailored suit and protects the valuable content of the entire case. iCase features the patented LiftoMatic telescopic feet. These lift the iBook into working position right inside the case - with essential ports being directly accessible. Slide off the lid, press on the far corners of your iBook and presto, your mobile desk is ready! The LiftoMatic telescopic feet add a slight angle to the iBook that nicely compensates the typical downward slope of your knees in a sitting position, making for a level workspace. Below the space for the iBook you find cutouts for essential accessories. A spare battery and the power supply have their tailored slots just like the iPod does - Say Hello to iPod! The slot for the power supply accommodates both the old UFO-style power supply and the new power brick in one convenient location. With the iBook 12 being so compact, it was possible to also provide space for up to 3 CD jewel cases, too. The cutouts for accessories are covered by a hard separator (not shown) that protects the iBook from being scratched by accessories with a hard surface. For those who require even more space there is an iCase12Plus. The sidebag and carrying strap in iCase12Plus can be purchased individually to upgrade an iCase12 or as part of a complete iCase12Plus package. iCase12 sells for $ 299. Sooner or later nearly every computer user has this problem. You get a new USB or FireWire device, or you need to plug in an audio device, and you have to practically dismantle your carefully arranged desktop to get to the rear ports or crawl under your desk. What you need is a way to put your most frequently accessed ports up front where you use them every day. You don't need another box that you have to hold down every time you want to plug or unplug something or one that's always falling over sideways with the weight of the cables plugged into it. What you need is a RePorter from Marathon. The Marathon RePorter isn't just another box. It's an extension of the rear panel of your computer. A single cable houses connectors to the rear panel ports and puts them up front where you need them. RePorter rests on your desk within easy reach, wherever you need it. RePorter's shape begs you to pick it up and cradle it in your hand while you use it. Plug into RePorter. Drop it on the desk without a second thought. RePorter puts two USB ports, FireWire 400 and 800, and audio in and out ports where they're easy to get to on your desk. Or on your laptop when you're traveling. It's a simple idea and a simple design. You'll wonder how you got along without it. The RePorter introductory price is $99. Ship date is projected for the end of Summer, 2003. Preorders are being accepted online. WiebeTech has announced a 500 GB 7200 RPM spindle speed version of DuoGB, its innovative dual FireWire drive in one enclosure. "We are now able to offer a dual 500 GB (2 x 250 GB) FireWire drive with 7200 RPM spindle speed for $999.95," said James Wiebe, CEO of WiebeTech. "This is a no compromise high performance configuration, which is immediately available. This new configuration joins other configurations already shipping in our DuoGB product line." All configurations of DuoGB are now shipping from stock. Aluminum/Metal Enclosure: Gorgeous case provides EMI protection and ruggedness in an enclosure which looks great. 90 - 264 VAC transformer: World compatible power supply. In the U.S. and Canada, dealers may purchase any configuration of MicroGB+ from WiebeTech's distributor, Dr Bott, or from dealers. All configurations are in stock and available directly from WiebeTech. Canadian resellers may purchase products from EMJ. Two new collections of beautifully detailed wallpapers by Rob David Randtoul specifically aimed at users of Apple's Cinema Displays and PowerBook laptops. Each is painstakingly rendered in widescreen format (8:5 ratio) at both 1920 x 1200 pixels and 1440 x 900. PlasmaDesign.co.uk is committed to adding one new widescreen wallpaper to the collection every week for the remainder of 2003. These stylish images are designed to look great on the new generation of widescreen LCD displays found in all Apple Flat Panel monitors, Titanium PowerBook 15" and the all new Aluminium PowerBook 17". These wallpapers are available to members only. Lifetime membership costs $5 and provides access to Rob David Randtouls' entire catalogue of artwork, past, present and future. Instant access to the entire collection of standard ratio, 4:3 images (over 90 images at present and growing at the rate of one per week) rendered at a beautifully detailed 1600 x 1200 pixels. Access to the new 'widescreen collection' suitable for use on Apple Cinema displays and PowerBooks. All images rendered at 1920 x 1200 and 1440 x 900. 12" iBook 700, 128/20/CD-ROM, free carrying case, $888. Get the $30 256 MB "No Stinkin' Rebate" Power Max RAM deal, and get Microsoft Office for $199. 12" iBook 800, 128/30/Combo, free carrying case, $1,077. Get the $30 256 MB "No Stinkin' Rebate" Power Max RAM deal, and get Microsoft Office for $199.